I recently purchased the Vertical Greetings stamp set because I have no other stamp set that has a vertical agreeing that is simple and straightforward. I love these topiary trees, too! They can also be stamped just using one section, so a plant instead of a tree. The next card was inspired by Brian King's card at Stamp With Brian. I believe he used another Christmas print, but here I used some retired paper. Looks so elegant! I used the Fine Tip Glue pen on the star to give it some shine. Goes on easy and dries fast! The sentiment is from a retired stamp set. My third card was inspired by Sue Vine at Miss Pink's Craft Spot. I did add one touch of my own--those two Rhinestones. They are there because I got ink on a spot that I didn't want there! I love to use "mistakes" as an opportunity to be even MORE creative! Thank you for stopping by today! I hope you have a wonderful weekend. Won't you leave a comment for me so I know you were here? 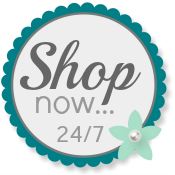 Use my Online Store any time you need your own Stampin' Up! supplies.